Today Senate Leader Mitch McConnell said that Republican leaders will focus on cutting Social Security, Medicare, and Medicaid. Pay attention to financial advice your financial adviser won't give you. Advisers do not emphasize that the government is a vital financial partner and partnership requires engagement. Government programs that ensure a baseline of income and health-care security insure our own household baseline security. It seems older people are getting the message; but younger not so much. Every adult eligible for Medicare and Social Security can vote, and they vote more. In the 2016 Presidential election turnout was 78% for people over age 75 and 58% for all Americans. A key part of financial planning is understanding the roles the major government social insurance programs, Social Security, Medicare, and Medicaid will play in your later years. Consider this: they are worth almost a million dollars to a middle-income American. According to economist Eugene Steuerle and his colleagues at the Urban Institute, a single man who retires in the year 2020 after a full career earning a median wage (about $44,000) can expect to receive $536,000 in Social Security and Medicare benefits. In a couple where each spouse earned constant “average” wages over a career beginning at age 22 and retired on his or her 65th birthday would have over $1 million in health and retirement benefits. The expected benefits for couples turning 65 in 2050—age 30 today—are scheduled to rise under current law to almost $2 million. These are stunning numbers. Our country made a commitment during the Depression to make sure that everyone and their families would be protected as they aged and if they became disabled. But national commitments don't renew themselves. Voting does. The tax cuts in 2017 were a result of the Republican control of the federal government -- almost all Republicans voted for the tax cuts and almost all Democrats did not. The cuts added $1 trillion to the federal deficit and the nonpartisan Joint Committee on Taxation did not support Republican arguments that the $1.5 trillion tax cut would pay for itself with economic growth. Senator McConnell's announcement today makes clear political elites will use Social Security, Medicare and Medicaid as bargaining chips in budget negotiations and call for cuts in government spending. The higher deficits caused by the tax cuts of 2017 will fuel the chronic attack to cut the programs. White House economic adviser Larry Kudlow commented that “We have to be tougher on spending." Mitch McConnell just said rising federal deficits and debt is not the Republican’s fault but the deficit is caused by unwillingness to contain spending on Medicare, Medicaid and Social Security. Reality #1: Social Security is an essential form of insurance. It provides support for young families in the event of the death or disability of its breadwinners. It helps children with severe disabilities. It insures workers against old age, disability, or dying and leaving behind a survivor without adequate income. As a retirement benefit, Social Security is worth about $300,000 for the average household. Equally important, its benefits are guaranteed. In contrast, 401(k) returns are not guaranteed. Reality #2: Social Security and Medicare benefit all workers, whether white-, pink-, or blue-collar. In 2012, 55 million Americans (out of a population of 313 million) cashed Social Security checks. These were members of all segments of society— rich and poor, left and right. Economist Moshe Milevsky makes this clear in his excellent book Your Money Milestones: A Guide to Making the 9 Most 102 Important Financial Decisions of Your Life. He writes that all households, rich and poor, have the government as an economic partner. We all pay taxes, and we all receive benefits from it. Through our votes, we exercise some control over how that money is spent. So no matter what your political leanings are or what your tax bracket is, the government is part of your financial life and always will be. This is equally true for the corporate CEO, the small business owner, and the starving artist. Reality #3: Social Security is on sound financial footing. In fact, it’s a lean and efficient success. In 2015, its administrative expenses (as a percentage of all Social Security spending) were less than .7%, compare that with the average 401(k), which has expenses three times as high – which can erode lifetime benefits considerably by 20-30%. Any clear-sighted look at Social Security’s finances, free of politically motivated spin, shows that the program is in strong shape. It has a reserve fund to pay all benefits until 2034 without any change in current policy. And with some small policy changes—for instance, raising the payroll tax by 2.83 percentage points (shared between employer and employee) or eliminating the earnings cap—we could put the system in balance for the next 75 years. (The earning cap means that only wage income up to a certain ceiling is currently subject to Social Security taxes. In 2019, it will be $132,900, but that figure will rise in response to wage inflation.) We are easily poised to keep the system healthy well into the future. The rising federal deficits will surely lead to political efforts next year to cut spending on Social Security, Medicare, and Medicaid if nothing changes. Vote. The American workforce is an aging one, filled with people concerned about retirement. Still, despite the aging population, $140 billion in annual tax breaks, and relatively light regulation of defined contribution plans, retirement plan coverage at work (including defined benefit and 401(k)-type coverage) has declined over the last two decades. Just 40 percent of workers were covered by any type of retirement plan through their workplace in 2017, 4 percentage points lower than in 2014. And retirement plan coverage has fallen in 14 out of 17 years since 2000. The lack of retirement plan coverage hits some groups more than others. And, though employer-provided retirement plan coverage declined for every demographic group, some groups lost more than others. The coverage rate for white (down 5 points to 43 percent), black (down 5 points to 38 percent) and Asian (down 4 points to 37 percent) workers all fell significantly. Coverage for Hispanic workers (down 1 point to 29 percent) remains lower than for other workers. A surprising and politically important fact is that workplace retirement plan coverage fell the most for high-income workers. Coverage of workers in the top 10 percent of the income distribution (those with incomes more than $115,000) fell to 50 percent in 2017, down 10 percentage points compared to 2014. Coverage of workers in the next 40 percent of earners (between $42,000 and $115,000) fell 7 percentage points to 50 percent. Finally, just 34 percent of workers in the bottom half of the income distribution were covered by a retirement plan at work, down 4 percentage points from 2014. Union workers’ retirement plan coverage is twice that of nonunion workers, but their 67 percent coverage rate is down 3 points and that of non-union workers is 36 percent, down 5 points. Coverage of private sector employees declined by 4 percentage points, to a low of 38 percent. The coverage rate for public sector employees was 68 percent (down 4). Workers in information and communications jobs (42 percent, down 10) experienced the greatest decline in coverage, followed by workers in finance, insurance & real estate jobs (42 percent, down 7). In sum, just when the labor force necessitates more retirement coverage – workers are aging, they expect to live longer, and Social Security benefits are not likely to increase – coverage falls. The 401(k) was supposed to be so popular for people and firms. The government -- relative to DB plans -- lightly regulates 401(k)-type and IRA plans and 401(k) plans are cheaper than defined benefit plans for firms. However, the voluntary system still fails to cover most workers; only 40 percent of workers are covered. Michael Papadopolous provide research assistance for this report. Source and notes: Author’s calculation using the March supplement of the Current Population Survey, 2015 and 2018 and the March supplement of the Current Population Survey, 1999-2018 (survey asks about coverage in previous calendar year). Sample includes workers ages 25-64 who report having worked at least 35 hours per week. Starting in 2013, the Census Bureau changed questions related to retirement income, but not questions related to workplace retirement plan coverage. In 2013, it fielded the old questions to 5/8 of the sample and the new questions to 3/8 of the sample. We present data for retirement plan coverage in 2012 for these two samples separately. Another source found that a change in the CPS questionnaire in 2014 accounts for part the decrease seen in subsequent years (EBRI report). The direct question regarding workplace retirement plan coverage was unchanged, but other questions related to retirement income were changed. However, the trend of decreasing coverage predates the questionnaire change and alternative surveys of retirement plan coverage coverage such as the Survey of Income and Program Participation and the Survey of Consumer Finances show decreasing coverage over similar time periods. Recent data does not allow defined benefit and defined contribution plans to be analyzed separately. Why not just expand Social Security to solve the retirement crises? If we expanded Social Security to provide adequate retirement for the vast majority of American workers payroll taxes would rise to nearly over 25% percent of pay– up from 12.4%. In contrast, the U.S. Social Security system taxes workers and employers 12.4% (6.2% each) which in turn pays for low benefits -- a 35% replacement rate for the average worker. If the U.S. wanted to reach a target replacement rate of 70% -- and that is what most of us need -- the payroll tax would double. (The table at the end of the article, which matches selected nations' payroll tax with their pension benefits, indicates the U.S. rate is 15% because that includes the OECD estimation of Supplementary Security Income. which is funded by general revenues). When 52% of older workers are pushed out of their jobs, working longer is not a viable choice. The stark truth is that a significant share of older workers -- age 55-64 -- are not anywhere near being on track to afford retirement. The median retirement account balance for older workers is only $15,000. Even the highest income workers -- those earning over $200,000 per year who are in the top ten percent of the income distribution -- do not have enough money to retire and maintain their standard of living. Their median account balance is under a year’s salary at $200,000 and 15% of the highest earners have no retirement plan except Social Security. For nearly 20 years, the advice to older people has been to make up for inadequate retirement wealth by working longer. 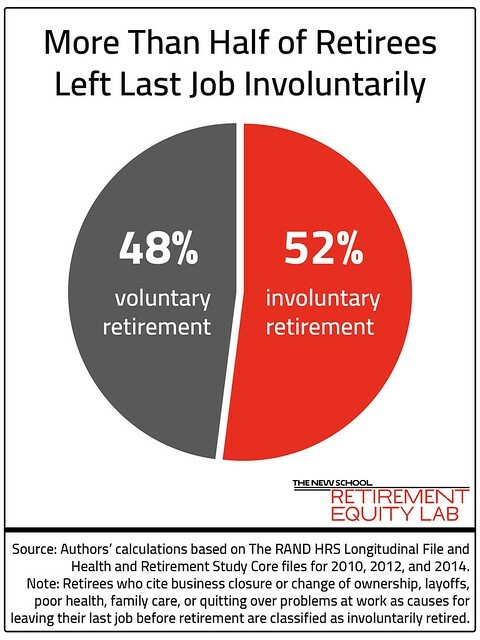 Yet, from 2008 to 2014, at least 52% of retirees over 55 left their last job involuntarily as a result of direct job loss (they were laid off or their business closed or changed ownership); they felt they were pushed out so they quit; their health deteriorated; or they had to leave work to take care of a sick family member. University of Massachusetts Sociologist Katherine Newman (in a forthcoming book Downhill from Here, 2019) tells the story of one worker whose friend told him how to navigate the financial options his company offered him. “Take the lump sum and run… the company is going to hell,” was the given advice. Interviews of workers who left Verizon years before they intended to revealed that, “the company was hovering over its older workers, pressuring them with more rigorous performance evaluations and emphasizing if they didn’t take the retirement deal they could face retractions in benefits instead.” These stories illustrate the pressure and difficulties older workers face as they work longer to make up for a lack of savings. Often, working longer is unsustainable and cannot serve as an alternative to adequate retirement savings. Those pushed into retirement early face barriers to returning to work. They are likely to be unemployed longer than younger people. And, if older people land a job after searching for work it is likely their new job will pay 25% less than their previous salary. How did we get here? Retirement used to be a time most middle-class workers could remain middle-class retirees. The 401(k) plan was born in the early 1980s and since then has become the primary retirement vehicle for most American workers despite design flaws like patchy coverage, high fees, and opportunity to take pre-retirement withdrawals. Those exposed to the 401(k) system for most of their working lives are now approaching retirement with far less than they need to maintain their standard of living. The result is that forty percent of middle class older workers are at risk of being downwardly mobile and falling into poverty when they reach retirement age. Public policy that relies on the hope that people can work longer to make up for eroding pensions is not realistic. Hope is not a plan. To ensure people can retire when they need to without experiencing economic deprivation we need to strengthen Social Security, get some control over Medicare premiums and copays, and create pension plans that every worker and employer must contribute to.And the large share of older workers forced into retirement makes it clear: because of many factors -- dynamics of a labor market, which demands ever-changing skills, health issues, and age discrimination -- working longer is not a solution to the retirement income security crisis. Workers cannot rely on being able to work until they are ready to retire. My coauthor and I, Tony James, have proposed Guaranteed Retirement Accounts (GRAs), a not-for-profit 401(k) or IRA plan. The proposed GRAs are universal, secure retirement accounts funded by employer and employee contributions throughout a worker’s career paired with a refundable tax credit. They would allow all Americans access to dignified retirements after a lifetime of work. Working longer is not a solution to the retirement savings crisis because workers cannot rely on being able to work until they are ready to retire.